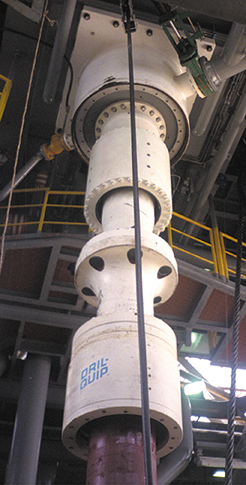 Dril-Quip's Diverter Systems provide field-proven protection from shallow gas. Dril-Quip offers Diverter designs for land rigs (ADS), jack-up, platform (MD Diverter System) and floating drilling operations (MDF Diverter System). The Dril-Quip Diverter minimizes the number of mechanical and hydraulic connections required for installation to facilitate ease of operations.